The Filth of Progress explores the untold side of a well-known American story. 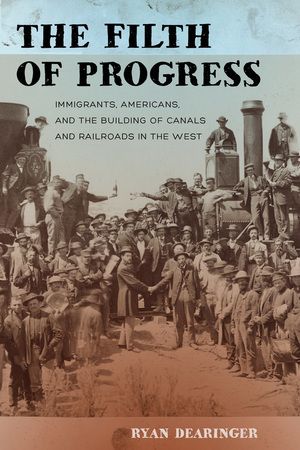 For more than a century, accounts of progress in the West foregrounded the technological feats performed while canals and railroads were built and lionized the capitalists who financed the projects. This book salvages stories often omitted from the triumphant narrative of progress by focusing on the suffering and survival of the workers who were treated as outsiders. Ryan Dearinger examines the moving frontiers of canal and railroad construction workers in the tumultuous years of American expansion, from the completion of the Erie Canal in 1825 to the joining of the Central Pacific and Union Pacific railroads in 1869. He tells the story of the immigrants and Americans—the Irish, Chinese, Mormons, and native-born citizens—whose labor created the West’s infrastructure and turned the nation’s dreams of a continental empire into a reality. Dearinger reveals that canals and railroads were not static monuments to progress but moving spaces of conflict and contestation. Ryan Dearinger is Associate Professor of History at Eastern Oregon University.